Laurel Sumac Malosma laurina is very ubiquitous in the Santa Monica Mountains, one of the predominant evergreen shrubs populating the hillsides throughout the year. It grows quickly and strong, forming a rounded shape, but may perish from a cold frost. However, after either frost or a fire, it is quick to resprout leaves and stems from its large underground burl (the photo at lower right is within a year after a fire). Leaves on this plant are up to 6 inches long, leathery, lanceolate, folded and curved back (kind of like a taco), starting out red then turning to a bright green. Frequently the red color remains in the mature leaf's edges. Stems also start out red, then turn reddish-brown then sometimes gray as the plant matures. 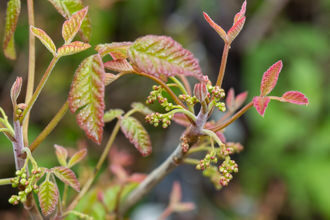 Flowering occurs in early summer primarily, with the terminal clusters of small cream-colored flowers quickly giving way to red berries with white seeds. 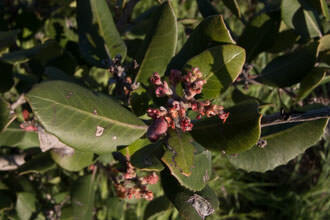 The flower clusters persist on the plant well after the flowers and berries are spent. According to the USDA Source of this information this plant can live as long as 47 years! The same article mentions a plant in the Santa Monica Mountains having a root depth of forty-three feet. Coastal sage is where you will find Laurle Sumac alongwith its frequent neighbors: Sugar Bush, Giant Wild Rye, Toyon, White,Black or Purple Sage and California Sagebrush. 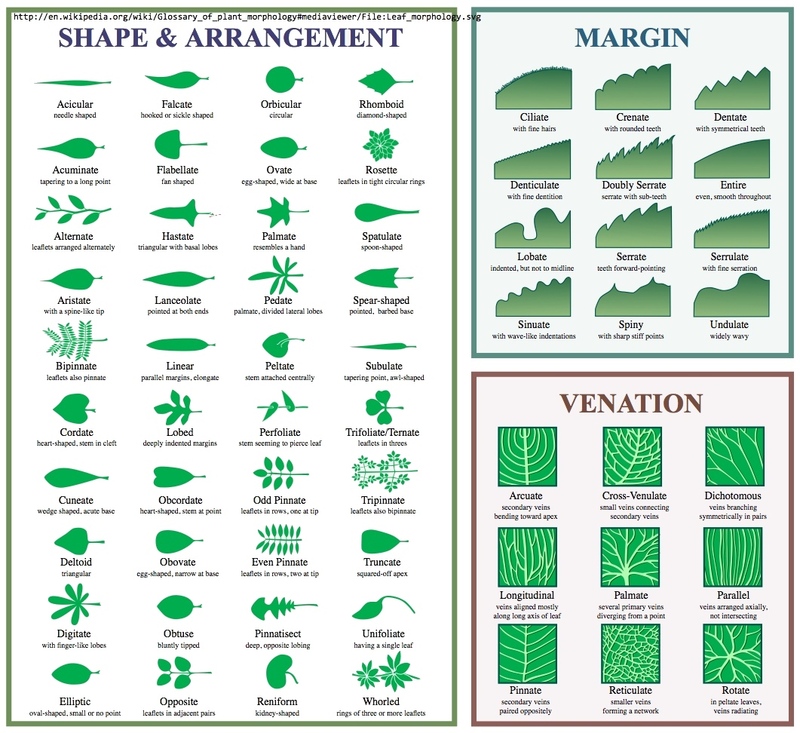 Next time you see this plant, see if you can identify its neighbors as well. 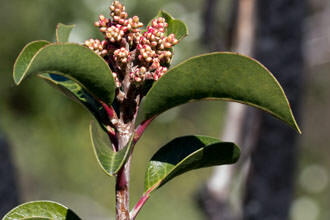 Laurel Sumac ranges in size between 6 and 15 feet, provides shade during the summer for a variety of creatures and has some of the deepest leaf litter among chaparral plants. The genus name Malosma translates to "strong smell", refering to the aroma of the plant, especially its leaves when crushed. The species name laurina means "laurel-like". Last modified: November 21 2018 09:34:41.